Join us for a look at a classic Norfolk & Western locomotive in action on one of the oldest tourist railroads in the United States. Former N&W 4-8-0 #475 was built by Baldwin in 1906. The class M 4-8-0s combined a larger boiler with similar running gear to the earlier class W 2-8-0s, resulting in a more powerful and better steaming locomotive. Strasburg purchased #475 from Iowa�s Boone & Scenic Valley in 1991 and she has been one of the railroad�s regular locomotives since the mid 90s. She is the only operating 4-8-0 in the U.S.
We shot #475 in operation over five days in May, 2013. She was lettered for the Strasburg at the time of our visit, with the lettering in the font and style of the latter years of N&W steam. We filmed many trackside scenes at most of the well known locations along the line between East Strasburg and Leaman Place. In addition, we filmed aboard both passenger and freight trains and filmed aboard the locomotive. Two different whistles were used on the locomotive during our visit; a standard N&W �Hoot� whistle and a higher pitched single note whistle. This is, we believe, the most up close and personal look available of this unique locomotive in operation. The products this producer offers have a home-made appearance. They are usually made in extremely small quantities. Everything we sell is brand new direct from the producer. This product comes in a slimline 7mm width DVD case. Steamboy (Revere MA US) on 2019-04-12 13:29:58. 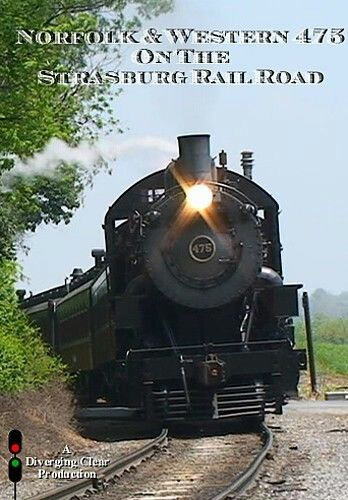 In this now 5 year old DVD from 2014, this program features a week long visit to one of America�s most popular steam powered tourist railroads. This 51 minute program features onboard rides from the coaches, in the cab, and also lots of trackside chases with the now 113 year old N&W locomotive. On different days during the May 2013 visit, 475 wore 2 different hooter whistles. First half was a deep hoot, and the second half was a medium to high type. The final segment in this program shows 475 on an early sunrise morning caboose hop to pick up a covered hopper at leaman place junction. That segment itself also contains some riding footage, mostly from the cupola of the caboose. While Great Western 90 was down for repairs during the visit, Canadian National 89 also makes a cameo appearance but it didn�t operate during the 475 coverage. This is a great program for steam lovers, N&W fans, Lancaster county Pennsylvania visitors, and all Railfans everywhere who love to hear the sounds of the once Only operating N&W Engine in the 21st century until the return of J class 4-8-4 #611 in 2015.